I've heard of the wolves on Wall Street, but the coyotes at Columbia were a new one. It's hard to believe, but at least 3 coyotes have been spotted recently in Manhattan. They were seen in Central Park, and on the nearby campus of Columbia University. The theory is that they walked along the Amtrak right-of-way, which goes along the Hudson River from the northern suburbs, through the Bronx, and over a railroad bridge onto the island of Manhattan. From there, Amtrak continues along the Hudson, next to a series of parks. Then the tracks go underground, near Grant's Tomb in Riverside Park. The wandering coyotes would want to leave the right-of-way there rather than entering the tunnel, putting them only a couple of blocks from Columbia's campus. After scaring a few students as they cut through campus, it is across the street to Morningside Park. From there, it is just 1 block cater-corner to Central Park. Finally, 843 acres of nature. I hope they have roadrunners! 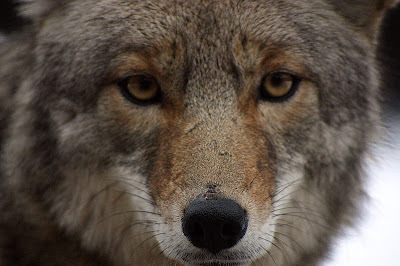 For more about the coyotes, and links to photos, check out the New York City wildlife blog Out Walking the Dog. For even more, including an earlier visit in 2006, check out the blog of the Natural Resources Defense Council. Here's a comment on the Gothamist blog from someone who spotted one of the coyotes as late as this past Friday (2/19/10). The best photo is here, at the NY Times. The photo above, by the way, is not from Manhattan. It is from Wikimedia. Great round-up on the coyote. I'm so glad to hear of the most recent sighting in Central Park. And thank you for the link! My theory is that the city must be focusing its wildlife attention on trapping and vaccinating its raccoons to control the rabies epidemic, allowing the coyotes to operate under the radar for a little while. Rabid raccoons pose a real danger, which the coyotes don't - at least, right now. This will be a fascinating story to follow! Yes, this is definitely a interesting story. I agree the rabid racoons are a bigger threat - until they bite the coyotes, that is! Did you see the movie Cujo based on the book by Stephen King? The present version from the mechanised view which has recently observed the repair may be the kinetic replica rolex sale also known as a computerized view. These types of view include a comparable inside framework since the mechanised view nevertheless depend on the actual motion from the person in order to energy the actual hublot replica uk. They're often much less reliable compared to other designs associated with energy with regard to wrist watches; there's a larger probability that they need to shed period, actually a couple of seconds every single day. You have to keep in mind that hublot replica sale possess various styles which will match various events as well as locations. If you wish to go to official occasions, you will find steel wrist watches that you could put on. Sporting activities will require the sports activities view in order to endure the actual strength as well as the type of exercise that the sports activities guy will. Wrist watches function being an phrase of the character. These people help to make an effect as well as make an impression on on the general public the hublot replica uk concerning the person. These people are available in types as well as occasionally likely to the shop to find the greatest watch with regard to you may be mind-boggling. The actual racks may meet a person along with wrist watches that can come in several dimensions, designs, calls, supplies, rings as well as uses : additionally from various expenses, obviously. Additionally, you will hublot replica sale various manufacturers or even can make.